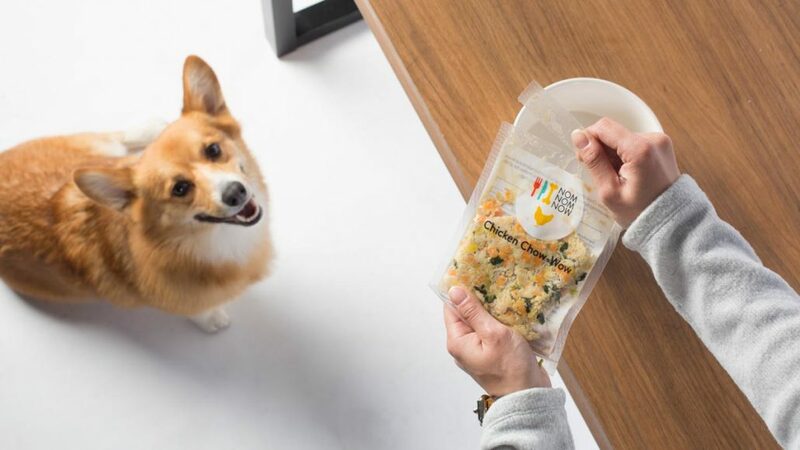 Founded in 2015 and headquartered in Oakland, CA, NomNomNow delivers healthy and nutritious dog meals made with the freshest, restaurant-quality ingredients – all with the convenience of home delivery and free shipping. NomNomNow meals are cooked weekly in the company’s local FDA-compliant kitchen, individually proportioned, tailored to meet the specific nutrition needs of each dog, and ready to serve with no preparation. The story begins with a pair of mini Australian Shepherds named Harlee & Mim and a handful of dog lovers in San Francisco. In February 2013 what would become the founding family team of NomNomNow went to casually look at puppies. 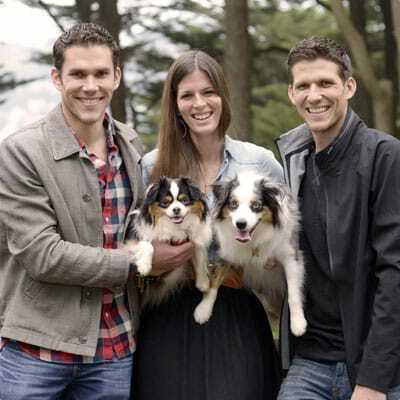 Alex, Zach & Nate all grew up with dogs but hadn’t had them for decades as college and career got in the way. As all dog owners know, looking at puppies is not a casual activity as they’re liable to steal your heart! Naturally the group fell in love at first sight, and adopted half-sisters Mim & Harlee. Bringing home the girls now meant searching for dog food, and the team was surprised to see how little had changed in the dog food space since the 1980s: most dog food was still kibble or canned, filled with unpronounceable ingredients and industrial filler – the dog equivalent of microwaveable dinners. Surely there had to be a better solution. Just as we’ve learned about how important real, fresh food is to people, the same must be true for dogs. Beginning in late 2014 the team began experimenting with cooking and delivering fresh food for friends and family. Cooking fresh took on added urgency as Harlee developed health issues related to a compromised immune system, and her vet recommended a fully fresh diet. As Harlee’s health improved and rave reviews about the food and service came in, Nate, Zach & Alex decided that the missing piece in the process was an expert nutritionist who could formulate the best possible recipes. Enter Dr. Justin Shmalberg, a clinician and professor at a leading college of veterinary medicine and one of the world’s leading experts on cutting-edge dog nutrition. Dr. Shmalberg is a core member of the NomNomNow team and has personally formulated each of our recipes to ensure that their customers receive the best possible food for their dogs. All NomNomNow recipes are made fresh weekly with restaurant quality ingredients, gently cooked for safety and digestibility, and their service is centered around providing the friendliest, most convenient experience possible for their customers. We highly recommend that you give them a try and join the fresh food revolution. After all, we eat fresh, why shouldn’t our pets? Why Should I Make the Effort to Switch to NomNomNow? — All meals are delivered fresh, not frozen. — Always free delivery – with weekly, bi-weekly, and monthly options available depending on location to all 48 contiguous US states. — Auto-delivery as a subscription. — All packaging is recyclable. — Customers can pause, update, edit, or cancel anytime. — Individually portioned meals are measured to suit your dog’s caloric needs. — NomNomNow offers 4 fresh dog recipes (Pork, Chicken, Turkey, and Beef), and 2 flavors of treats (Beef & Chicken). They also offer 2 fresh cat recipes (Chicken and Salmon). — All recipes are formulated by one of the country’s leading veterinary nutritionists, Dr. Justin Shmalberg. — All food is human grade, vitamins are all-natural. — All recipes meet AAFCO (Association of American Feed Control Officials). — Recipes are made of a handful ingredients: meat, vegetables, healthy oils, and vitamin and nutrient blend. No additives, no artificial ingredients. — NomNomNow sends 14 meal packs each week: feed 2 meal packs per day, for 7 days. Bi-weekly deliveries are 2x and Monthly deliveries are 4x. — Each meal pack is in a easy-open container – just tear open and serve. No scissors required. — NomNomNow does not customize recipes, but Dr. Shmalberg can advise on dog’s health conditions and history to suggest an appropriate recipe for your dog’s needs. — Customers can easily change payment, delivery, & dog information in their account. — Price is calculated based on dog’s age, weight, activity level, and recipe selected. — NomNomNow does offer discounts for multi-dog families. — All of NomNomNow’s food is prepared in a human-grade kitchen that NomNomNow 100% owns and controls, in the San Francisco Bay Area. — Their kitchen team inspects all ingredients upon arrival, and NomNomNow only uses those that meet their own high standards. –Food is prepared and portioned by hand. — All ingredients are from the USA. — Their kitchen is unique; 100% designed and dedicated fresh dog food kitchen that meets all FDA requirements.